The Australian Academy of Cinema and Television Arts Awards, known as the AACTA Awards, are presented annually by the Australian Academy of Cinema and Television Arts (AACTA). The awards recognise excellence of professionals in the film and television industry, including the producers, directors, actors, writers and cinematographers. It is the most prestigious awards ceremony for the Australian film and television industry. They are generally considered to be the Australian counterpart of the Academy Awards and British Academy Awards. The awards, previously called Australian Film Institute Awards or AFI Awards, began in 1958 and involved 30 nominations across six categories. They expanded in 1986 to cover television as well as film. The AACTA Awards were instituted in 2011. As of 2011, the Australian awards take place at the Sydney Opera House in Sydney and the International Awards, inaugurated on 27 January 2012, are presented every January in Los Angeles. The awards were presented annually by the Australian Film Institute (AFI) as the Australian Film Institute Awards (more commonly known as the AFI Awards), "to recognise and honour outstanding achievement in the Australian film and television industry." They were instituted in 1958, "as a way to improve the impoverished state of Australian cinema", and was part of the Melbourne International Film Festival (known then as the Melbourne Film Festival) until 1972. The first AFI Awards ceremony consisted of seven fields: Documentary, Educational, Advertising, Experimental Film, Public Relations and Teaching, and an Open category for other films which didn't fit in the aforementioned categories. Between 1958–1980, submitted films were presented with a gold, silver or bronze prize, and in some circumstances, a Grand Prix award, which was the highest honour a film could receive. Additionally, films were also presented with a gold or silver medallion for technical achievements, and films which didn't receive a prize was given a certificate of honourable mention. From the awards inception to 1968, documentary and educational films were the only films submitted for awards due to few feature films produced in Australia, but in 1969, Jack and Jill: A Postscript became the first feature film to receive an award from the AFI, with a silver prize in the "Open" category, and is considered a winner in the Best Film category of the current awards. Up until 1970, prizes were handed out in recognition of the film and production, rather than achievements of individual filmmakers and crafts people. However, from 1971 special achievement awards were introduced to recognise actors, directors, screenwriters, musicians, editors and cinematographers in feature films, and from 1975, an additional cash prize was given per achievement. In 1977 feature film categories became competitive, while non-feature films continued to be awarded the gold, silver and bronze prizes until 1981, when they also became competitive. In 1976 the awards were broadcast live on television for the first time on the Nine Network at the Hilton Hotel in Melbourne. In 1986 television categories were introduced, presenting awards for mini-series and telefeatures before expanding to dramas, comedies and documentaries in the 1990s. To be eligible for nomination, a production must be an Australian production or program and, in the case of a film, cannot have been previously submitted for an award; the material is sent to the AFI in DVD or video formats; for a feature film, it must have been publicly exhibited for seven consecutive days in at least two Australian states; for television and documentaries, the production must have been broadcast on television between the eligibility period. The submission of a production is accompanied by an entry fee in Australian dollars, of up to A$1680 for feature films, $400 for documentaries, $330 for short film and animation and $1125 for television categories. At the time of the awards inception, a jury of five judges, composed of film critics and filmmakers, determined the winner of a production. In 1976, the jury system was replaced by a peer voting process for feature films which would allow public members the right to vote in the Best Film category. The nominees and winners were later peer-voted by a jury which was made up of representatives from all industry crafts, including members of guilds, who have a "professional membership" with the AFI. When the AFI announced the launch of the Australian Academy of Cinema and Television Arts, it introduced the Chapters who vote through a two step voting process. The fifteen Chapters consist of professionals from industry guilds and organisations including actors, producers, directors and screenwriters. In round one of feature film voting, each chapter determines the nominees for their own respective category; in round two all members of the Academy can vote for the shortlisted nominees in each category to determine the winner. All television and non-feature film awards, and feature film pre-selection are determined by juries. Members of the Australian Film Institute are eligible to vote in the Best Short Fiction Film, Best Short Animation and Audience Choice award categories only. The votes are audited by accounting firm Ernst and Young from 2011. The awards have been televised on the Nine Network every year between 2005 until 2012 where it was broadcast by Network Ten. A lack of recognition for the Australian film production Disgrace (released in late 2008) was noted by critics Eddie Cockrell and Lynden Barber, commentator Charles Waterstreet and others. 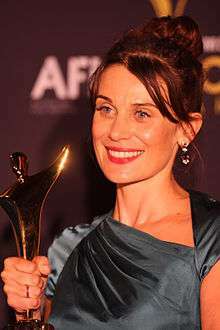 The film – based on a book by the South African-born Australian novellist J. M. Coetzee, set in South Africa and made on location there with an international cast – was directed and adapted for the screen by the Australian husband and wife team of Anna Maria Monticelli and Steve Jacobs. Conversely, the 13 AACTA awards, including an acting award presented to Leonardo DiCaprio, received in 2014 by Baz Luhrmann's The Great Gatsby were controversial, due to the film's perceived Americanness. Lurhrmann pointed put that – although the film was financed by a major US film studio and based on a classic US novel of the same name – Gatsby met the creitera an Australian production. 1 2 "Introduction". 2011 AFI Awards Rule Book. Australian Film Institute. Archived from the original on 8 August 2011. Retrieved 21 July 2011. 1 2 "The Australian Film Institute – Celebrating 50 Years of Pride and Passion". Australian Film Institute. Archived from the original on 21 May 2009. Retrieved 21 May 2009. ↑ "Rush named president of Australian Oscars". Australian Broadcasting Corporationi. 19 August 2011. 1 2 3 4 Brendan Swift (1 June 2011). "AFI proposes Australian Academy, officially moves Awards date". Inside Film. Retrieved 23 July 2011. ↑ "About the AACTA Awards". AACTA. Retrieved 28 December 2014. 1 2 Hope, Cathy; Dickerson, Adam. "'Films for the intelligent layman': The origins of the Sydney and Melbourne Film Festivals (1952–1958)". Screening the Past. Latrobe University. Retrieved 20 July 2011. 1 2 3 French, Lisa; Poole, Mark (2009). Shining a Light: 50 Years of the Australian Film Institute. Australian Teachers of Media. p. 29. ISBN 1-876467-20-7. 1 2 "IMDb Australian Film Institute Awards". The Internet Movie Database. Retrieved 19 January 2011. 1 2 Staff (3 December 1969). "P.M. Presents Film Awards". Sydney Morning Herald. Retrieved 18 August 2011. ↑ Staff (24 March 1975). "Shearer feature gets good clip of 'Oscars'". The Age. Retrieved 25 August 2011. ↑ Staff (24 March 1975). "Shearers' strike film wins top Aust award". Sydney Morning Herald. Retrieved 25 August 2011. ↑ French, Lisa; Poole, Mark (2009). Shining a Light: 50 Years of the Australian Film Institute. Australian Teachers of Media. p. 110. ISBN 1-876467-20-7. ↑ "AACTA – Past Winners: 1969". Australian Academy of Cinema and Television Arts (AACTA). Australian Academy of Cinema and Television Arts (AACTA). Retrieved 24 August 2011. ↑ French, Lisa; Poole, Mark (2009). Shining a Light: 50 Years of the Australian Film Institute. Australian Teachers of Media. p. 49. ISBN 1-876467-20-7. 1 2 French, Lisa; Poole, Mark (2009). Shining a Light: 50 Years of the Australian Film Institute. Australian Teachers of Media. pp. 142–182. ISBN 1-876467-20-7. ↑ French, Lisa; Poole, Mark (2009). Shining a Light: 50 Years of the Australian Film Institute. Australian Teachers of Media. p. 108. ISBN 1-876467-20-7. ↑ French, Lisa; Poole, Mark (2009). Shining a Light: 50 Years of the Australian Film Institute. Australian Teachers of Media. p. 50. ISBN 1-876467-20-7. ↑ French, Lisa; Poole, Mark (2009). Shining a Light: 50 Years of the Australian Film Institute. Australian Teachers of Media. p. 113. ISBN 1-876467-20-7. ↑ French, Lisa; Poole, Mark (2009). Shining a Light: 50 Years of the Australian Film Institute. Australian Teachers of Media. pp. 183–200. ISBN 1-876467-20-7. ↑ "Australian Film Institute history". Australian Film Institute. Archived from the original on 13 June 2011. Retrieved 20 July 2011. 1 2 Paul Kalina (29 June 2011). "AFI looks to Academy Awards in reinvention". Sydney Morning Herald. Retrieved 23 July 2011. 1 2 "Proposed AFI Developments". Australian Film Institute. Archived from the original on 13 June 2011. Retrieved 21 July 2011. ↑ Cara Nash (1 June 2011). "AFI looks to Academy Awards in reinvention". Filmink. Archived from the original on 5 June 2011. Retrieved 19 August 2011. ↑ Staff reporter (20 July 2011). "The Australian Film Institute to go ahead with Australian Academy". Inside film (IF). Retrieved 19 August 2011. ↑ Quinn, Karl (19 August 2011). "AFI gong gone in hustle for global muscle". The Age. Fairfax Media. Retrieved 19 August 2011. ↑ Bodey, Michael (8 November 2011). "Industry academy announces new awards". The Australian. News Limited. Retrieved 12 November 2011. ↑ "Raymond Longford Award". Australian Academy of Cinema and Television Arts (AACTA). Archived from the original on 27 May 2012. Retrieved 23 November 2011. ↑ "Rule 3 – Making an Entry to the Awards". 2011 AFI Awards Rule Book. Australian Film Institute. Archived from the original on 8 August 2011. Retrieved 21 July 2011. ↑ "Rule 6 – Special Conditions for Documentary". 2011 AFI Awards Rule Book. Australian Film Institute. Archived from the original on 8 August 2011. Retrieved 21 July 2011. ↑ "Rule 8 – Special Conditions for Television Programs". 2011 AFI Awards Rule Book. Australian Film Institute. Archived from the original on 8 August 2011. Retrieved 21 July 2011. ↑ "2011 AFI Awards submissions". Australian Film Institute. Retrieved 21 July 2011. ↑ French, Lisa; Poole, Mark (2009). Shining a Light: 50 Years of the Australian Film Institute. Australian Teachers of Media. p. 47. ISBN 1-876467-20-7. ↑ French, Lisa; Poole, Mark (2009). Shining a Light: 50 Years of the Australian Film Institute. Australian Teachers of Media. p. 51. ISBN 1-876467-20-7. ↑ "Call for jurors to take part in judging the 2011 Samsung Mobile AFI Awards" (PDF). Australian Film Institute. Retrieved 21 July 2011. ↑ "Exclusive Industry Membership Offer". Australian Film Institute. Retrieved 25 July 2011. ↑ Staff (18 August 2011). "Rush president of new academy, AACTA". Encore Magazine. Focal Attractions. Retrieved 20 August 2011. ↑ "AACTA Honorary Council" (PDF). Australian Academy of Cinema and Television Arts (AACTA). Retrieved 20 August 2011. 1 2 3 "AACTA – The Awards – Voting". Australian Academy of Cinema and Television Arts (AACTA). Retrieved 5 November 2011. ↑ AFI/AACTA Festival of Film: Judges Handbook (PDF). Australian Academy of Cinema and Television Arts (AACTA). p. 7. Retrieved 7 November 2011. ↑ "ADAM AND EVE : AUSTRALIAN FILM INSTITUTE GRAND PRIX AWARD 1963". National Film and Sound Archive. Retrieved 29 November 2011. 1 2 3 "Medal – The Kodak Film Award, Kodak (Australia) Pty Ltd, Australia, 1958 (Bronze Medal)". Museum Victoria. Retrieved 7 November 2011. ↑ "Medal – The Kodak Film Award, Kodak (Australia) Pty Ltd, Australia, 1958 (Silver Medal)". Museum Victoria. Retrieved 7 November 2011. 1 2 "Object record: Australian Film Institute Award, 1980, to Jack Thompson for his role of leading actor in the film Breaker Morant". National Museum of Australia. Retrieved 7 November 2011. 1 2 3 4 5 "The Story of the Statuette". Australian Academy of Cinema and Television Arts. Retrieved 7 November 2011. 1 2 Rashelle Predovnik (2 September 2011). "Gomboc's design shines". Echo News. Archived from the original on 25 April 2012. Retrieved 7 November 2011. ↑ David Knox (19 August 2011). "Australian Academy replaces AFI Awards". TV Tonight. Retrieved 23 July 2011. ↑ Staff (19 August 2011). "Rush named film and TV academy president". Sky News Australia. Retrieved 23 July 2011. ↑ Garry Maddox (19 August 2011). "And the award for re-invention goes to …". Smh.com.au. Retrieved 23 July 2011. 1 2 3 "Rule 4.3 – Ownership of AACTA Award statuettes" (PDF). 2013 AACTA Awards Rule Book. Australian Film Institute. Retrieved 1 June 2012. ↑ French, Lisa; Poole, Mark (2009). Shining a Light: 50 Years of the Australian Film Institute. Australian Teachers of Media. p. 73. ISBN 1-876467-20-7. ↑ "AACTA launches international awards; announces dates for local awards". Mumbrella. Focal Attractions. 8 November 2011. Retrieved 28 May 2012. 1 2 "Australian Academy announces first award winners" (PDF). Australian Academy of Cinema and Television Arts (AACTA). 15 January 2012. Retrieved 28 May 2012. ↑ "About the AFI". Australian Film Institute. Archived from the original on 13 June 2011. Retrieved 23 July 2011. ↑ "Archived copy". Archived from the original on 1 February 2015. Retrieved 2015-01-29. ↑ "Blanchett and Ledger to present at AFI Awards". Herald Sun. 24 November 2006. Retrieved 21 May 2009. ↑ Pascuzzi, Carmine; Matt Deller. "Spotlight: 2008 L'Oreal Paris AFI Awards". Mediasearch. Retrieved 21 May 2009. ↑ "2009 Samsung Mobile AFI Awards event details released" (PDF). 2009 Australian Film Institute Awards. Australian Film Institute. 2009. Retrieved 21 November 2010. ↑ Miller, Kylie (26 October 2005). "AFI drama over bent rules". The Age. Melbourne. Retrieved 21 May 2009. ↑ Gates, Rhoderick (30 October 2006). "ARIA Will Never Rock". Global Echo. ↑ "Great Gatsby director Baz Luhrmann says his film is an Australian movie". News Corp. Retrieved 1 February 2014. 1 2 3 4 5 6 7 8 9 "AFI Award Winners Feature Categories 1958–2009". Australian Film Institute. 2009. Archived from the original on 20 September 2009. Retrieved 3 May 2010.